If you use whole wheat tortillas for this Low Carb Tuna Wrap your carbohydrates will amount to 12 grams per sandwich. 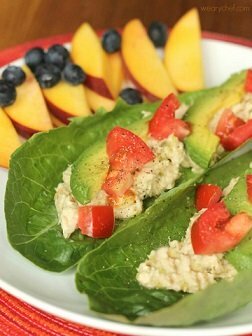 By using lettuce as the wrap, you'll be down to approximately 7 grams of carbs per sandwich. The added bonus is the taste. It's delicious. Start with high quality canned tuna or even leftover cooked tuna steaks. Note: Just what is "high quality" tuna? Quality starts with knowing the source of supply. Tuna that is surface caught in the coastal areas of the North Pacific at "the cold water edge," where the warm tropical water meets with the cold arctic currents. "Surface Catch" out of these areas produces the highest oil content Albacore Tuna in the world. Hook and line fishing describes the method used to catch the fish. This method assures no dolphins or turtles are harvested accidentally with the tuna. Combine catch method and harvest area with proper handling from the boat through processing – and you get the finest and safest Albacore Tuna on the market today. Certain grocery stores where I live have quality tuna packed in olive oil which I believe is even more flavorful than tuna packed in water. But the quality of the tuna is first in importance. If using tuna packed in water, drain it and then add a bit of your own extra virgin olive oil, if desired. 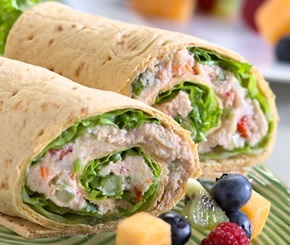 Enjoy your Low Carb Tuna Wrap and the company of those you share it with! Did you know? Q: I follow a low-carb diet, can I eat avocados? If so, how many carbs do they have? A: Yes, you can definitely enjoy avocados if you are following a low-carbohydrate eating plan. In fact, 1/5 of a medium avocado or 1 oz. contributes the following to your diet: Carbs = 3-4 g, Dietary Fiber – 2 g and Sugar – 0 g.